Nowadays, it is good for us people to be fully aware on what is happening and what will happen to us in the following days. We must not practice taking for granted the precautions given by the government to warn us in terms of natural calamity. 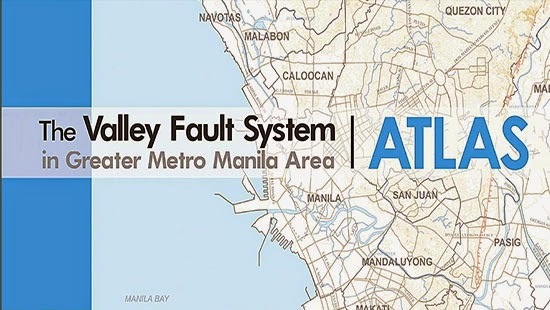 Just like today, Philippine Institute of Volcanology and Seismology (PHIVOLCS) issued a list of areas near fault lines which they collected and illustrate through a new system which they called 'Valley Fault System Atlas' or VFS. According to PHIVOLCS, VFS is composed of two segments which are the 'East Valley Fault Line' and 'West Valley Fault Line. East Valley Fault Line runs through Rizal while West Valley Fault Lines run through Bulacan, Rizal, Metro Manila, Cavite, and Laguna. PHIVOLCS has previously warned the public in the possible movement of the West Valley Fault Line. Director Renato U. Solidum Jr. of PHIVOLCS said, "We don't usually use the word ripe because the fact would indicate that the West Valley Fault can move in our lifetime simply because the last earthquake that happened from this fault, most likely the 1658 earthquake 357 years ago, and the interval of movement of the fault is roughly between 400-600 years. So that's very close." PHIVOLCS also mentioned that the WVFL can possibly generate a 7.2 Magnitude of earthquake while EVFL can generate 6.2 Magnitude Earthquake. Comments or suggestions about "List of Areas in Metro Manila & Provinces near Fault Lines" is important to us, you may share it by using the comment box below.